Definition at line 394 of file conmsg.h. Definition at line 396 of file conmsg.h. Referenced by GetConsoleHardwareState(), and SetConsoleHardwareState(). Definition at line 398 of file conmsg.h. Definition at line 397 of file conmsg.h. 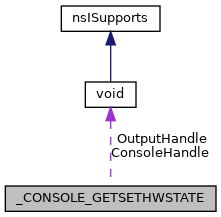 Referenced by CSR_API(), GetConsoleHardwareState(), and SetConsoleHardwareState(). Definition at line 399 of file conmsg.h.